The National Golf Club is Australia’s largest private golf club and it’s situated in Cape Schanck on the dramatically undulating and beautifully sandy seaside land of Victoria’s Mornington Peninsula. There’s no shortage of golf to be played at the National Golf Club, with three courses to choose from… the Old, the Ocean and the Moonah. All three courses appear in Australia’s Top 50 but if you only have the chance to play one round at the National Golf Club, make sure it’s on the Moonah course, which was designed by Greg Norman and Bob Harrison. The Mornington Peninsula could easily be one long stretch of golf holes and it must have been a challenge for the architects to decide on their routing plan. The rolling topography is perfectly suited to golf but the property is irregularly shaped which no doubt made the routing even trickier. The links-like land pitches and rolls across swales and hollows in a most pleasing manner, but when the fickle prevailing winds are up, hold on to your hat and ignore your scorecard. You’ll need good mastery of the low bump-and-run shot to get close to the pin on the Moonah’s raised, but open-fronted greens. This is a very traditional course with outstanding bunkering and you’ll need the old-fashioned game to score well here at the fabulous National Moonah. If the club could somehow assemble a stronger collection of one-shot holes, we think the raw and memorable Moonah would warrant permanent inclusion in the World Top 100. Ok, I am going to sound a bit of a nitpick, but I have knocked this down to an eagle simply because it is a it too tough for the average golfer. Many of the fairways can't be reached into the wind, even from forward tees, by mid to high handicap players. Too many fours and three are also not reachable in 2 or 1 by the same group. And a calm day here would be a gale anywhere else. So it can be a slog.Having said that, once you get near the greens - in however many shots it takes - this course comes alive. You need your A game and plenty imagination to make up and downs, and many a golfer has quality three putts due to the speed and slopes on the greens. As for the bunkers, getting out is the trick, getting close is a fluke.This is a true championship course and if it was in the US would host an US Open or PGA. Sadly, its too far from anything to even host a decent tournament in Australia, but it would be great to watch the best on it. would tend to agree with you on those points. a brute for mere mortals but would be great seeing how the pros would score. a lot of excellent holes none the less. I think I had the rare experience of the last 3 playing easy and downwind. One of the greatest thrills in my golfing life arriving here and looking down on the seeming miles and miles or great golf country. Great golf courses, too!!! Magnificent country with great golf added by Robert Jones Jnr, Peter Thomson & Michael Wolveridge, and Greg Norman & Bob Harrison. Heroes and artists all! The only bad thing about golf on the Mornington Peninsula is ... having to leave it. The Mornington Peninsula is yet another example of a top golfing location in Australia, let alone the greater Melbourne area. 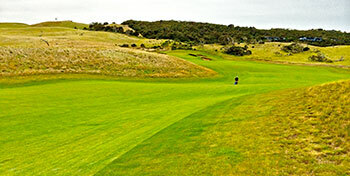 Golfers have plenty of enjoyable, fun and accessible courses to choose from down along the Tasman Sea. As long as you can get comfortable with the fact that you’ll be golfing at a location called Cape Schanck, then you’ll certainly enjoy your round at this wonderful track. Driving into the property, the vista of the vast rolling property is the talking point. The potential for 2 or 3 more courses is all around you as the terrain and opportunity is there. Norman and Harrison laid out a superb routing throughout this roller-coaster property. The spines and saddles that cut their way through the fairways look so natural and the routing flows effortlessly. Depending on the wind, the front nine plays shorter, but length is irrelevant when you’re faced with downwind wedge shots into firm greens that require you to think long and hard about where you want the first bounce to be. I always enjoyed the “infinity” feeling you get hitting into some of these exposed green-sites. As you get down to the end of the property at the wonderful punchbowl 11th green, you turn back for home and face the toughest stretch on the course. Throughout the round, regardless of the weather, the demand for precision is very high, as the slopes and noticeable changes in elevation will eat you up. Playing the 12th through 16th holes into a wind feels almost impossible, but that doesn't take away from the architectural wonders undulating all around you. This course is just as much fun to walk as it is to play. It is very firm and certainly favours those golfers who can play the ball along the ground. The rolling terrain offers endless opportunities to use your imagination to figure out how best to keep the ball on the slick greens. I encourage golfers, when appropriate, to look around you and just see how vast the property is. There is a frequent sense of great openness and exposure to the elements. There are many memorable moments around the course, including the difficulty of the last 3 holes. The uphill par 4 16th hole may be the toughest par 4 in Australia, and it really plays like a par 4 and a half. If you hit your drive into either of the fairway bunkers, you pretty much can’t hit the green in regulation. The very long par 3 17th is just as punishing surrounded by hazards. Although you are beside the sea, you can’t see the water from the golf course, which I felt was a little disappointing given the location, and the wonderful ocean view you have from the new clubhouse. The Ocean course borders the Moonah with commendable land and opportunity. One would argue why the club didn’t pick the best holes from both courses and make a stunning 18 hole routing that takes advantage of all the natural benefits sitting on your doorstep. It’s just a theory. The popularity of this golfing area is growing each year, and with a large membership that has to travel to get here, it’s a surprise that the enormous clubhouse doesn't have bedrooms. Put this course on your OZ itinerary, as it is part of the greatest golf complex in the country. Hi, Just in response to your very last comment about getting together 18 holes of the best. As a member there we actually do have a "composite course challenge" once a month with a routing that flows through 6 holes from each course that make a set of 18 holes the most challenging you will play. If this course was stuck in between NGLA and Shinnecock Hills on New Yorks eastern Long Island then it would be Top 20 in the world. A great layout, with holes 9-12 to die for. Great land. Better undulation and second shot holes than most of the Worlds top 50. Mornington is the second best patch of golfing country in Australia after Melbourne and the Moonah at the brilliant National was the toughest course I played during my Victoria trip. Brutal does not sum up the difficulty playing here and my friend who’s a mid teens capper here would be a single figure player at my club in the US. It wasn’t very windy when I played the Moonah and I’m glad. It’s very close to being a true links experience but with much better playing surfaces. The last five holes are as tough as they come, perhaps as brutish as Carnoustie, The 400m No 16 into the breeze was a killer and if the wind was up I’m sure it would bring most handicap golfers to their knees. Best course of the National trio by some distance IMO. During my recent trip to OZ I played this great course. It's just as it says in the description. I played it from the back t's it's by no means an easy one, miss the fairway and you are chasing snakes. With the drought this course has done very well. They have well water and right now it just looks amazing fairways and greens are as green and lush as ever and the surrounding land is kind of like typical Australian wasteland. Just loved it. There are some ferocious par 4's in the mix as well. Unfortunately or fortunately I caught this course on the perfect day, almost no wind and that I was told is amazing for this area. A tip for an interesting experience....stay in the Cape Shank light house about 5 minutes from the course. The accommodation is average but the lighthouse grounds and view of the pacific are amazing.